During a no-contact advisory, the public is advised to avoid contact with the water in the affected area. This means the District recommends against swimming, wading, or types of water recreation or play where water could be swallowed or get in the mouth, nose or eyes. People should also avoid direct skin contact if possible, and immediately wash with soap and water if they have exposure to the water. 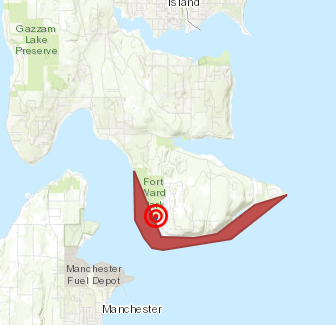 Signs have been posted in the immediate spill area and at public access points around the southern shoreline of Bainbridge Island. Approximate location of sewage spill noted with bullseye.